This photo shows the BBC Club Staff at Pebble Mill in 1987. 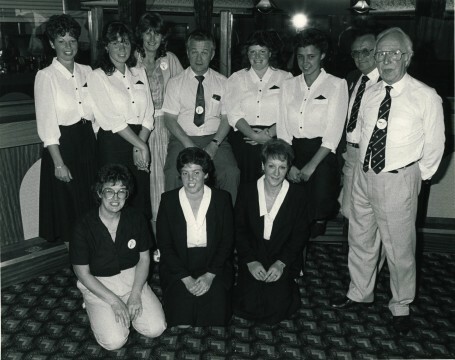 Included from left to right are Pauline Rice, Lesley Moore, Gail Herbert (Club Chairman), Jim Simmonds, Kim Giles, Theresa Gordon, Mac and H, Linda Parsonage, Hilary Paton, and Mavis Silver. The BBC Club was based in separate single storey building across the brook from the rest of Pebble Mill. It is the only building still standing on the site. BBC staff spent many a happy lunchtime over at the Club! It was an excellent place for networking and catching up on the gossip. Thanks to Gail for making the photo available. Wonderful memories and amazing that the club building has survived the destruction of PM! I recall of course that the original club bar was on the second floor inside the main building and it was a rather ‘sobering’ experience to work in that area when the club had moved and it became the newsroom for Radio WM! Of course, the club was not the same when it left the second floor. Much wheeling and dealing was carried out up there and much fun was had. We also had members of the corps of commissionaires in full uniform on the door. Yes great memories. I would dream of that little bridge leading to the club. It was particularly enjoyable after a live show when you just needed to relax and relive the horror of what you’d just been through with the rest of the team.